Hey friends, we’re missed seeing you last week! We’ve got a great week of specials from Mrs. Clélie’s kitchen. Here’s what’s cooking just for you: chicken and dumplings, shrimp and corn chowder, and spaghetti with meatballs. We’ll have our very own Louisiana red bean soup available all week! Thanks to Tami Arender for this wonderful piece on Stone House Eats in “This Week in Louisiana Agriculture“! Chicken and dumplings with house salad and bread. These dumplings come seeded with herbs in a house-made stock and cream sauce, and there’s no more elegant and comforting way to celebrate this week with a sumptuous dish of house-made chicken and dumplings. Called Il Divino (The Divine One) by many of his contemporaries because of his obsessive commitment to making unbelievably beautiful art, he had a little known dirtier side. He cared little for food or drink, taking either just on necessity to keep working, and his notoriously bad personal habits, e.g. not bathing, sleeping in his clothes and boots (which he seldom removed), kept him from having more apprentices to continue his legacy of artwork. We remember him for a work on which he labored for over seven years which premiered this week in 1512: The Sistine Chapel Ceiling. Yep, the creator of “The Creation of Adam” was none other than Michelangelo di Lodovico Buonarroti Simoni. We wonder what he could have created if he’d just taken a little more time to eat chicken and dumplings? We’ll have our very own Louisiana red bean soup available all week! Shrimp and corn chowder with house salad and a house-made pimento cheese biscuit. Our shrimp and corn chowder is heavenly potion of potatoes, cream, and shrimp. Comedian Dan Ackroyd admits, “Heaven to me is percussion and bass, a screaming guitar and a burbling Hammond B-3 organ. It’s a soup I love being immersed in.” Come get “immersed” in this corn chowder, it might just be heavenly. Spaghetti with fresh marinara sauce, house-made meatballs, and house salad and bread. 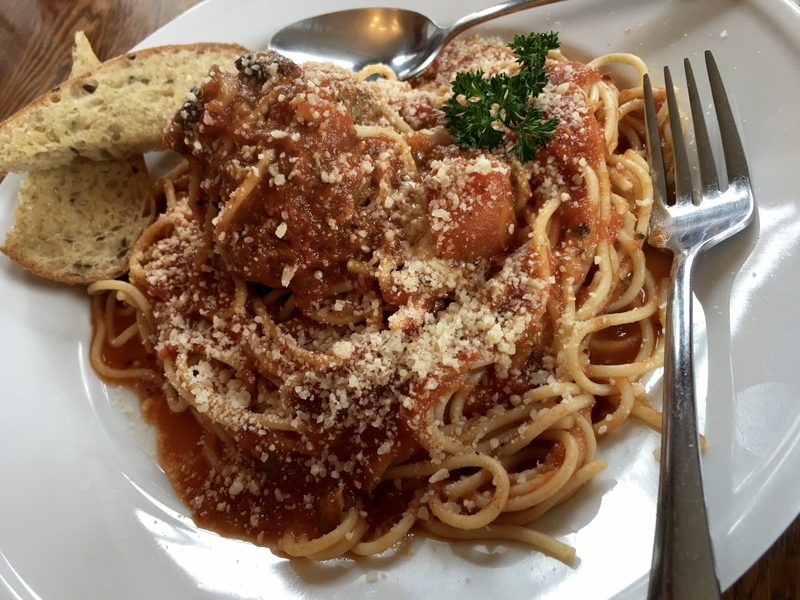 Yes, it’s the old stand-by, but ours contains a fresh and homemade marinara sauce and a 1/3 pound hand-patted meatball served over piping hot pasta, and it’s just the right kind of pastalicious serving that makes life a little better. Did you know that marinara sauce originated in Naples, Italy and the name comes from marinara the Italian word for “sailor”? Apparently, the wives waiting for their husbands to return from fishing at sea would sight them in the harbor. Then, they’d run to the kitchen to make this simple and quick sauce of olive oil, garlic, and tomatoes. Come join us at the table, our spaghetti and meatballs will take you back to old Naples. Hey friends, thanks for joining us on the first Friday of the month with a specially prepared meals just for you! We’ll host our next Friday Night Steak and Seafood on Friday, November 3, 2017. We’ll start seating at 5:30pm, and you may bring your own wine or beer. These nights are reservation only, so please make your reservations at (318) 267-4457 as soon as possible. We look forward to seeing you at the table! Previous PostFriday October 27, 2017 at Arlette!